Cover of the Jersey Journal 02.21.18 which can be read in full, here. During last year’s mayoral election, Mayor Ravi Bhalla’s employment with one of the state’s most politically-connected law firms was a major topic of discussion due to the many conflicts of interest his employment could cause. His law firm counted among its clients Suez Water, the city’s water system operator, as well as NJ Transit which owns significant property in Hoboken and is in the process of being redeveloped. During the course of the campaign, as public concern mounted about Ravi being connected with those statewide interests, he publicly announced that if elected he would, “be working full-time for the people of Hoboken, severing my employment with the firm.” As Mayor-elect he followed through on that and resigned from his position at the firm, Florio, Perucci, Steinhardt & Fader as he prepared to be the full-time mayor he promised voters he would be. But in February, just over a month into office, Ravi Bhalla broke his promise and taken a job as an attorney at the law firm Lavery, Selvaggi, Abromitis & Cohen -- a real estate, land use and zoning law firm that’s just as much a part of the establishment patronage network as his former firm. Hoboken’s mayor is paid the most in Hudson County and one of the highest in the entire state. For reference, 9 of the 12 mayors in the County make less than $33,000. Of the other three, Bayonne pays $72,000, Jersey City pays $115,600 and Hoboken tops the list at $116,100. Additionally, the mayor receives a generous benefits package for him and his entire family which includes health coverage and retirement. The only other mayor who is in the six-figure club, Jersey City’s Steve Fulop, only holds one job - mayor - and Hoboken deserves the same. Upon learning about the mayor’s second job, the City Council voted to pass a resolution urging the mayor to disclose details of the job. From that official inquiry, and only because the governing body publicly demanded transparency, it was disclosed that Mayor Bhalla would earn an annual salary of $60,000 for his new position, but more shockingly, unlimited commissions for all new business he brings to the firm (click here to read the agreement). So, let’s digest this. Our new Mayor who promised to work full time for the City is now in a business development role with a politically connected zoning and land use law firm with UNLIMITED earnings potential. That’s not the transparency voters were promised and deserve! In his own words, Mayor Bhalla “has no specific responsibilities” at the law firm and “is not expected to spend any time” at his second job. Why would any employer want a no-show employee without any specific responsibilities? The truth is that Ravi Bhalla has been hired to use his notoriety as our Mayor to benefit his new firm. If he secures a new client for his firm, maybe another entity that does business with Hoboken for example, he'll be compensated for it. And if a client needs a favor in Hudson County, they've got a Mayor on the payroll. It's the oldest play in the book for the political establishment, and the losers are taxpayers like us who get hit with the bill. In Jersey politics, this sadly only means one thing -- peddling and trading professional contracts for personal and political gain. It's not illegal, just ethically corrupt. State DCA ethics violation notice issued to Mayor-elect Bhalla for voting on a business partner's city contract while serving on City Council in 2011. 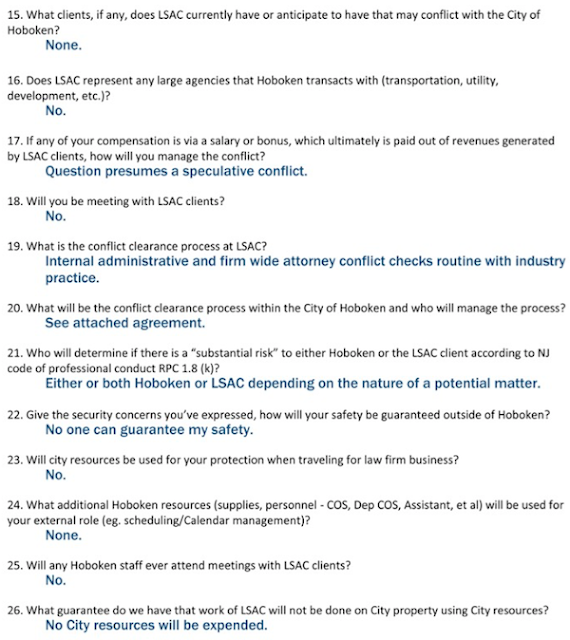 From the City Council’s official inquiry, we also learned that in responses to questions about conflicts of interest, Mayor Bhalla has proposed that the city’s chief municipal lawyer, commonly referred to as Hoboken’s “Corporation Counsel” provide advice on potential conflicts. The person who fills this position not only reports to the mayor and serves at his pleasure, but has also contributed financially to the mayor’s election account. Will Corporation Counsel disclose his findings to the City Council? Who will pay for the legal staff reviewing Mayor Bhalla’s business dealings? Seeing that the City’s chief lawyer is vested in the status quo and since his ethical oversight is over his own boss — it’s like the ethical wild west. The last time Ravi Bhalla confided in Corporation Council about a potential conflict, back in 2011, he failed to provide complete background of the case and was subsequently issued an ethics violation for voting on a business partners city contract. The notice was ironically handed down six days after he won the mayoral election...nearly six years after the violation initially took place. This just goes to show how long an ethics violation, once discovered and reported, takes to be properly heard. To make matters even worse, the new law firm that Mayor Bhalla is working for has numerous political and financial ties to his previous firm. Both firms are major contributors to a Political Action Committee called “Leadership PAC for Better Government,” an organization that has made thousands of dollars in political donations for the purpose of securing more government contracts for its founders. The PAC donated $2,000 to Donald Trump and $3,500 to Kim Guadagno. In fact, one of the principles of the firm recently served as the Chairman of the New Jersey Republican Party -- and he was replaced recently as Chairman by a partner in Ravi’s previous firm! Considering Mayor Bhalla promise to “stand up to Trump,” it’s offensive for him to join a Republican-leaning law firm that actively supports candidates who fight harder than anyone to push Trump’s agenda in NJ. This is a clear betrayal of Hoboken’s progressive values. Further, I am personally alarmed that Mr. Bhalla will be sharing the same title with a colleague at his new firm, former Congressman Jim Courter, who once ran as the Republican candidate for Governor, and called for limiting the rights of homosexuals to work as teachers, foster parents and camp counselors or in other jobs that put them in contact with children. Source: The New York Times. The above is exactly why it's so important for the City Council to act as a watchdog on this issue and ensure that Hoboken isn't for sale. I am currently in the process of drafting a comprehensive ethics ordinance to ensure that our mayor’s second job is transparent to all citizens and that he is held to the same standard as any other City employee.